Safe travels to all headed to Union Chapel later! Very much looking forward to brilliant reports and photos! We'll be queuing at the main entrance to the Union Chapel from 6:00pm, but some of us will be in the White Swan pub on the other side of Upper Street from 4:00pm onwards. You're welcome to join us there. I'll probably be lurking around the back entrance earlier in the afternoon, and some of Jonathan Ansell's fans may do the same, so I'm looking forward to catching up with them too. I'll be on my way soon. have to check into my hotel in Croydon first but will get to the Union Chapel as soon as I can. Enjoy the concert everyone! I hope you have a magnificent time. Have a great time all !!!. It appears as though I won't be able to make the concert after all- I have been given some medicine which is giving me some horrible side effects, mostly dizziness and have been advised not to travel very far for a few days- thanks to yet another ear infection . I have been helping to clear my gran's house which has been tough over the past few days which I'm told may not be helping the side effects but there we are. I've also been told I must attend a seminar at university at 6pm tonight, if I am planning on graduating next year- which I still remain hopeful I can! It turns out that my friend who I convinced to go with me can't make it either so I have given my tickets to my aunt and uncle who I believe have given them to their friends. I am so upset I can't make it but I am looking forward to seeing the photos and reading the reports- I'm hopeful there will be other concerts I can get to in the future, like many people here are! Have a fabulous time everyone! Sorry to hear that you're unwell -- that's a real bummer. But I'm sure that everyone who went will fully regale us of the night! I saw something on Twitter that seemed to indicate Hayley was playing the guitar?? Gee - must have been a night of surprises! Can't wait to hear more! I've also gathered that Hayley debuted new songs and they were very well received. Gosh, am I the first on this one? That makes it a first for me! The young girl disengaged herself from her taxi with her usual “Hi guys!”, sorted her bibs and bobs with her assistants, then settled into her usual (when she has time to spare) exchange of banter, remembering her regulars but taking time for being introduced to new hands. All seemed to augur well. The Union chapel seems nothing much from the outside but inside its architecture is unique and magnificent. Apparently, when first over in London, she had seen a performance here and had made up her mind that, when appropriate, she would like to perform there herself. Tonight was that performance. I have not seen Hayley on stage for over a year. I recall, when following her assiduously, one might notice a difference in her voice a month later, or that it might be two or three months before anything was noticeable. Tonight, the little girl had gone, although there was still that playful, girlishness about her. Here was the mature woman in so many aspects of her art. Her voice was a little deeper, there was more colour in it. Most obviously, as the evening wore on, her voice had acquired a greater stamina for the longer haul as well as a greater volume. Her first half was slightly varied “traditional” Hayley. It was the choice and balance of songs that gave it a different hue. The second half was definitely the young girl letting her hair down and wanting to push the boat out to more challenging stuff that stretched her abilities but never outpaced them. This was the performance of a mature and experienced artist, fully at home with herself and her stage and her backing musicians and more than comfortable with her audience who made it quite clear they were thrilled and very satisfied. This was one very happy girl delivering a tour de force that astounded, amazed and enthralled. ’nough said for now. Its 01:00 and definitely time for bed. Looking forward to hearing more about the setlist. Yes it was as Peter described it, a marathon performance really, well over two hours I think, perhaps two and a half, I lost track. Not only that but we wouldn't let Hasyley go, there were many encores, with a standing ovation from the entire audience at the end. I'll leave others to describe it in more detail, I'm too tired to remember it all but I've uploaded a few photos. Conditions were difficult for photography, it was so dark on stage that at one point, that Hayley said she couldn't read her set list to see what the next song was! Some my photos are rudimentary, especially in the first half and I haven't been able to sort out the white balance yet so it's mostly very "indoor light" and the coloured spotlights (few that they were) didn't help so colours may be wrong. Anyway here goes. Jillian I loved that song from Jonathan too. It is my favourite from his Two Hearts album. 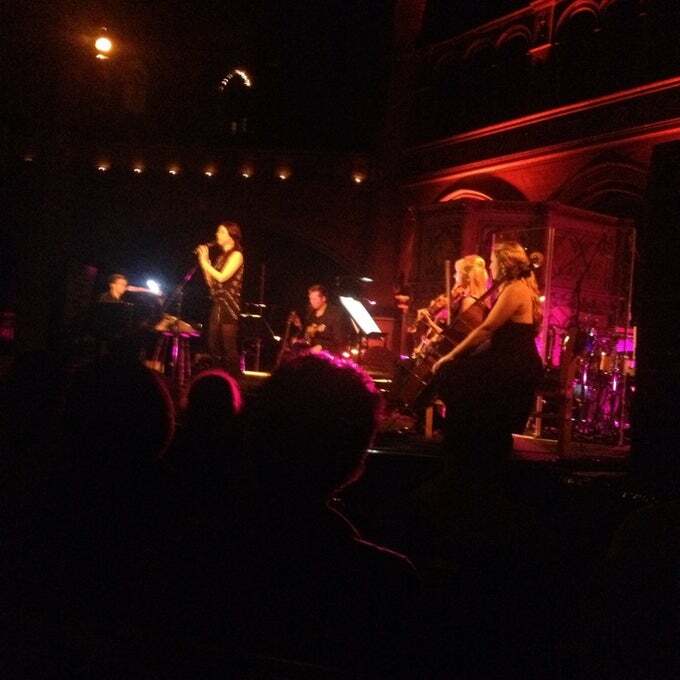 Here are four more photos from Union Chapel. Hayley after the interval - caused a bit of a stir. Boots an' all! Hayley and Jonathan. Vivo Per Lei"
Hmmm.... thinks Hayley... now what's this doing here? Tim in the background seems highly amused! OK then, if you all insist. Just Talk to Me! Happy memories, more tomorrow. G'night all!